Hyosung today announced the introduction of the limited edition Aquila 250 in India. 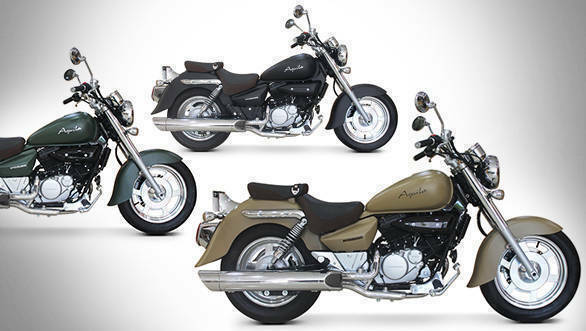 This special edition Aquila 250 is priced at Rs 2.94 lakh, ex-Delhi, making it Rs 10,000 more than the regular model. The changes that the special edition gets is purely cosmetic and that too three new shades - matte green, carbon black and desert brown. The company will be making 100 units of this edition. DSK Hyosung dealerships have confirmed that the special edition Aquila 250 will be on sale from this week onwards. Shirish Kulkarni, chairman, DSK Motowheels, stated, "The DSK Hyosung Aquila 250 has been a high-demand cruiser in the sub-500cc market segment. In order to mark its success, we are proud to announce 100 limited edition units of the Aquila 250 which will be available in three trendy colours, including matte green, carbon black and desert brown. We have partnered with various financial institutions to provide interest-free loans for all the motorcycles on offer in the DSK Hyosung line-up." The Hyosung Aquila 250 is powered by a V-twin 249cc motor that makes 26.21PS at 9,500rpm and produces 21.37Nm at 7,000rpm. This motor is mated to a 5-speed gearbox. The company's portfolio consists of GT250R, GT650R, GT650N, Aquila Pro and the ST7. At the 2016 Auto Expo, the company had stated that it plans to launch the GV300, GT300R sportsbike and the GD450; however, there are no clear details on the same.